Preparing for Divine Mercy Sunday and getting the Indulgence. On April 30, 2000, during the canonization mass of St. Faustina, St. Pope John Paul II established the first Sunday after Easter to be known as Divine Mercy Sunday. The new feast enhances the Easter season since it focuses on Christ's mercy and the forgiveness of sins. It was revealed in Sister Faustina's diary that it was Jesus Himself who asked for it to be celebrated on the first Sunday after Easter. A decree for a plenary indulgence for Divine Mercy Sunday was issued on June 29, 2002. In the domestic church, we can celebrate this great feast day and obtain the indulgence for our families. The words of Our Lord in the diary are very clear, He said, "I want the image to be solemnly blessed on the first Sunday after Easter, and I want it to be venerated publicly so that every soul may know about it. By means of the Image I shall be granting many graces to souls; so let every soul have access to it." (Diary 341, 570) The Image should be placed in the church so that everyone can see it, perhaps in the sanctuary area and at all the masses on that day so that everyone may venerate and know about it. How to obtain a plenary indulgence in our families! 1. 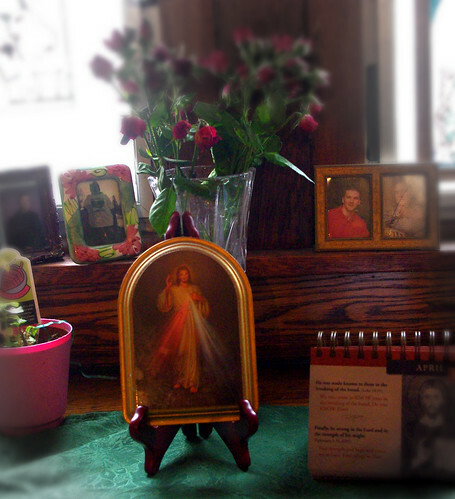 Display the Divine Mercy Image in our homes on Divine Mercy Sunday. A free image for download is here and here. This is our image displayed on a counter at home with some flowers. "The two rays, according to what Jesus Himself told her, denote blood and water. The blood recalls the sacrifice of Golgotha and the mystery of the Eucharist: the water makes us think of Baptism and the Gift of the Holy Spirit." 2. Get to Confession - this only has to be within 20 days of the date. However, if you are not in a state of grace, then of course, get to confession before Divine Mercy Sunday. 4. Tell someone about Divine Mercy- perhaps share with your spouse, siblings, friends, or teach your children. 5. Perform an act of mercy. Anyone who is married or married with children has LOTS of opportunities to display mercy!! This is a good day to practice that. Acts of mercy performed on this day are done for love of Christ. 6. Resolve to detach from sins, even venial sins. 7. Pray for Pope Francis's intentions. An Our Father and/or Hail Mary should suffice. 8. The indulgence can be applied to yourself or to a soul in purgatory. It has been said by some of the saints that if we are generous to the souls in purgatory, they will surely be generous with us when we are in need of their prayers in the future. Our Lord also said, "The first Sunday after Easter is the Feast of Mercy, but there must also be acts of mercy....I demand from you deeds of mercy, which are to arise out of love for Me." (Diary, 742) It is clear that Our Lord wants mercy to be shown to others and this can be done by telling everyone about the special promise of the total forgiveness of sins and punishment that He has graciously given to us. In the Holy Father's homilies, he often refers to the words of Our Lord that are found in the diary. In his homily on Divine Mercy Sunday in 2001 in Rome he said, "It is the appropriate and incisive answer that God wanted to offer to the questions and expectations of human beings in our time, marked by terrible tragedies. Divine Mercy! This is the Easter gift that the Church receives from the risen Christ and offers to humanity.'' He often quotes Our Lord by starting with "Jesus said to St. Faustina." He spoke of the Image of The Divine Mercy saying "The two rays, according to what Jesus Himself told her, denote blood and water. The blood recalls the sacrifice of Golgotha and the mystery of the Eucharist: the water makes us think of Baptism and the Gift of the Holy Spirit." So as we can see, the celebration of Divine Mercy Sunday is quite simple, in fact, outside of having an image of The Divine Mercy in the church to venerate, there really isn’t anything else to do on that day itself. It is Jesus Himself that does all the work on that day. Most of the energy should be focused on getting people to come back Church on Divine Mercy Sunday. Jesus will do the rest. All that we need to do is to tell everyone about the plenary indulgence and urge them to go to Confession. We cannot forget that Easter Sunday is the best time for us to talk about mercy, because the churches are so full. —pray for the intentions of the Supreme Pontiff.